What is not to love, a big huge meatball stuffed with cheese encased in onion and then wrapped in bacon and slathered with BBQ sauce. I think that is any man’s dream meal, hey wait, mine too!! They are perfect for game day!! The idea is in an area between cray cray and genius. You know that teetering, exciting threshold that gives you all the wonderfully crazy yet divine dishes!! Well this is one of them!! These are easy to make, really they are!! Come let me tell you how!! Although these are said to be BBQ they are made in the oven. They are brushed though with lots of BBQ sauce. 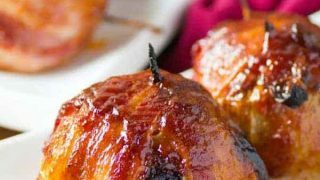 This is a perfect fall and winter meal when you are still craving the flavors of the BBQ but don’t want to venture outside in the nasty weather. The outside gets lovely and crispy while the inside meatballs stays juicy from the onion, bacon and BBQ sauce. I am sorry I didn’t cut one of these open for you but I was rushing to get one in “my belly”!! Man, are these delectable. Ken made a tray of them so we popped some into the freezer and they froze like a dream. A tip for making these is don’t do your meatballs all ahead of time but custom make them to the size of your onion. You want to use the larger layers of the onion and make meatballs accordingly, as the onion sizes get smaller so will your meatball. Then use another large onion to keep making more. The inner part of the onion can be used for another recipe, just pop it into the fridge wrapped. How to See if These are Done? How to see if these are done is easy with this wonderful instant read thermometer from Thermoworks. You don’t want to be cutting one of these open to see if they are done, that ruins them. 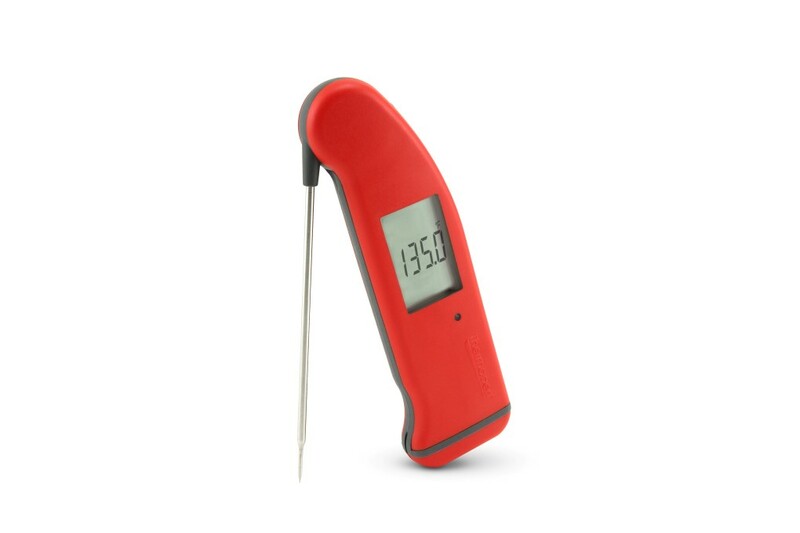 With this thermometer you will have a temperature in seconds. To go with this all you need is a great fresh salad like this one! 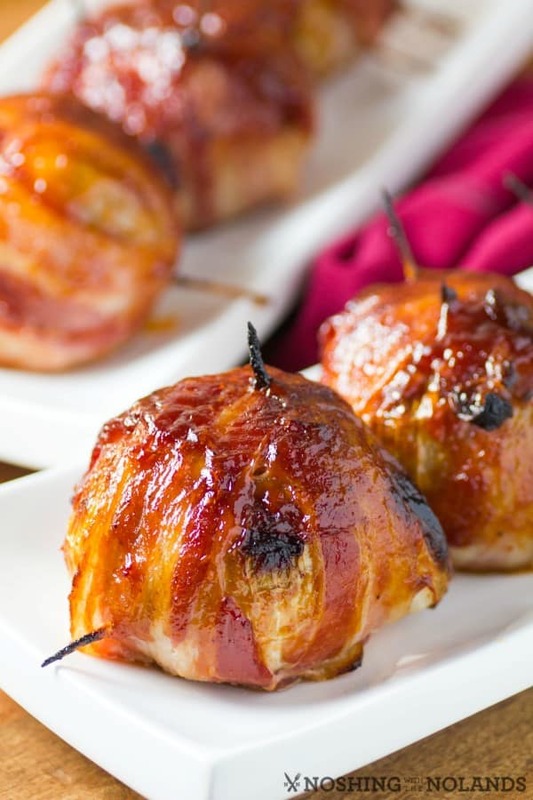 These BBQ Bacon Wrapped Onion Bombs are like large meatball stuffed onions, and are fabulous!! A must try recipe!! Mix the the meatball ingredients together, omitting the cheese, in a large bowl with your hands until well combined. Preheat the oven to 425F. Line a sided cookie sheet with foil and set aside. Slice the top and bottom off of an onion and peel off the skin. Cut the onion in half and now peel back the layers. Use the two sides of the onion and see how large you need to make your meatball. Stuff the meatball with the 1/2" cheese cube and roll into a ball. Insert your meatball in the onion halves and make sure it fits nicely, not too small or too large. 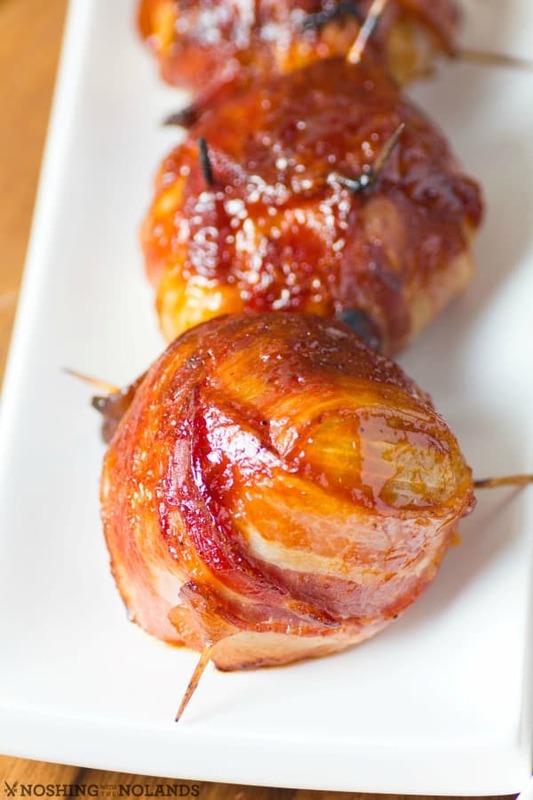 Wrap each of the onion bombs with 2-3 slices of bacon depending on the size of the bomb and secure with toothpicks. Bake on the prepared cookie sheet for 40 min. or until a thermometer reads 165F. Brush liberally with BBQ sauce and bake another 5-10 min. Oh my gosh! I’m totally making these for my husband for his birthday next week. He’s going to think I’m a genius!! HA! Thanks for a great recipe! They kind of rock as a guy’s recipe, hope he enjoys them!! As a guy who long gave up on controlling his health, this would make a great breakfast, lunch and dinner idea. I’m not kidding. I would literally eat these at any time, all the time. I can do vegetarian/vegan a couple of times a week but need my meat fix, could never take it away completely! All you had to say was bacon and I would say “Yum”!! Can I have an order to go? Beef stuffed onions wrapped in bacon? Yes, please! I think these are going to make an appearance at our next cook out. Those look so amazing! 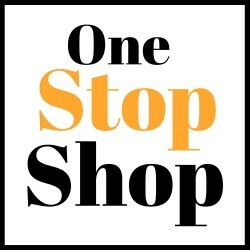 I have to give them a try soon. I could really go for some of these right about now too! Yum! Those look absolutely amazing! I think these would be perfect on the grill cooked over some wood chips. Yum! Anything wrapped in bacon makes me swoon! This looks perfect! Holy cow these could be life changing. I can’t imagine not needing to make like 4 billion of them for holiday appetizers. Definitely trying these! I have been looking for something different to make for our BBQ this weekend. These look so delicious and easy to make. I am excited to give them a try. Those sound so good! I would love to try these one night, I bet my husband would love them! Those look amazing! My husband would love these. Onions and bacon are two of my favorite foods! I think these would be awesome paired together. That looks like a little ball of heaven! Oh my goodness! Something to try at our next BBQ for sure! Awesome Dawn, so glad you liked them. It is a pretty cool recipe for sure!! Thank you for taking the time to tell me!! Made them tonight. I think I would prefer to bake them on a broiling pan next time so they don’t have to sit in the grease. They were oh so delicious! So glad you liked them. That is a good idea to bake them on a broiling pan! how many calories are in these bad boys? I am not sure Jess, they are not dietetic that is for sure! 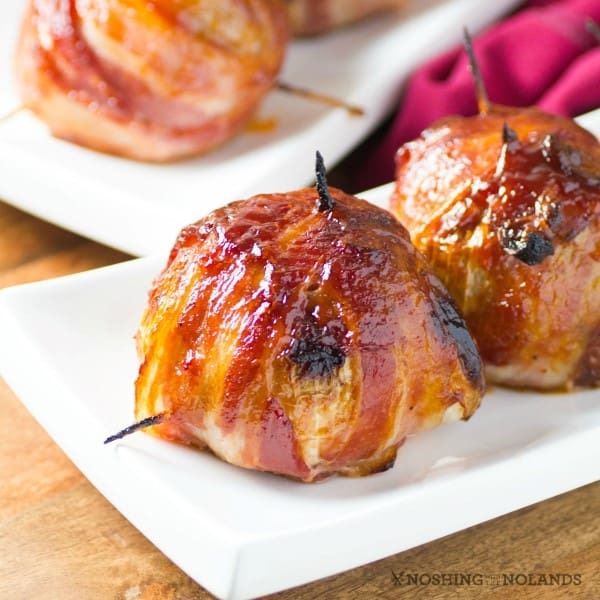 I initially thought these were an appetizer, however, if a pound of bacon usually has about 16 slices, and . . . you wrap each bomb with 2-3 slices, that means you can only get 6-8 bombs at the most, and each of the bombs will have 1/4 to 1/3 lb. meat (along with all the rest of the ingredients). This is sounding more like a main course than an appetizer. Yes Linda, they are an entree as they are too big for an appetizer in my opinion too! Might be being dense. Can someone help me – when you cut the onion in half. Do you just keep the outside peel? I’m not sure how the meat goes into the onion. Sorry, I was out of the country for a few days. Don’t cut the onion completely in half, you want the section of the onion but not the outside peel. Watch the video and that should clear things up for you. I want to try and make these for the Daytona 500 tomarrow. I am a bit set back about the size of them. Onions are usually pretty big in size and these look smaller. What size onion should I use? . Just use the smaller yellow onions and if the first one is too big then use the smaller ones as you go deeper into the onion.